CiM Camouflage (CiM464) is a medium. 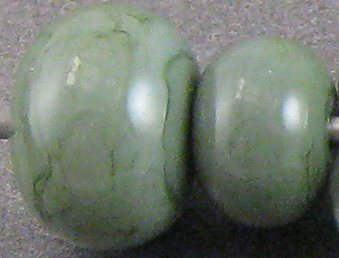 green opaque glass. It's quite streaky, separating on itself in lacelike patterns, and this behaviour seems to be aggravated by the addition of silver, becoming more pronounced. It reacts with Ivory, and my experiment with encasing it met with some cracking failure. My rods of this colour were extremely shocky, and I didn't enjoy using them at all. I only tried three, though, so that should probably not be taken as indicative of the whole batch's behaviour. Here, I've shot Camouflage and Amphibian spacers, side by side. You can see that Camouflage is darker and greener than Amphibian, which has a softer, slightly bluer and greyer hue. 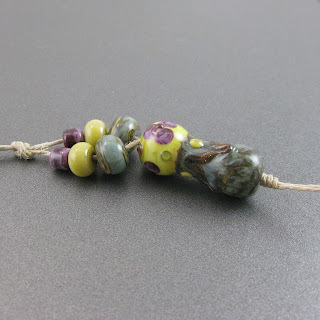 In the leftmost bead here, you can see the strange crazing lines that this colour developed. The beads are both single-colour but I probably added to the larger one multiple times from the same source rod. I don't think the lines developed along the additions, though, the way we see with some colours. 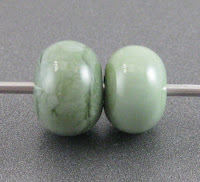 The bead on the left in this picture has silver leaf added to it, and the crazing of the surface is much more pronounced than it was in the spacer bead. When this kind of crazing or reticulation happens in other colours (like Dark Ivory, for instance) we call it 'curdling', but for some reason I am having trouble associating that word with something this colour. 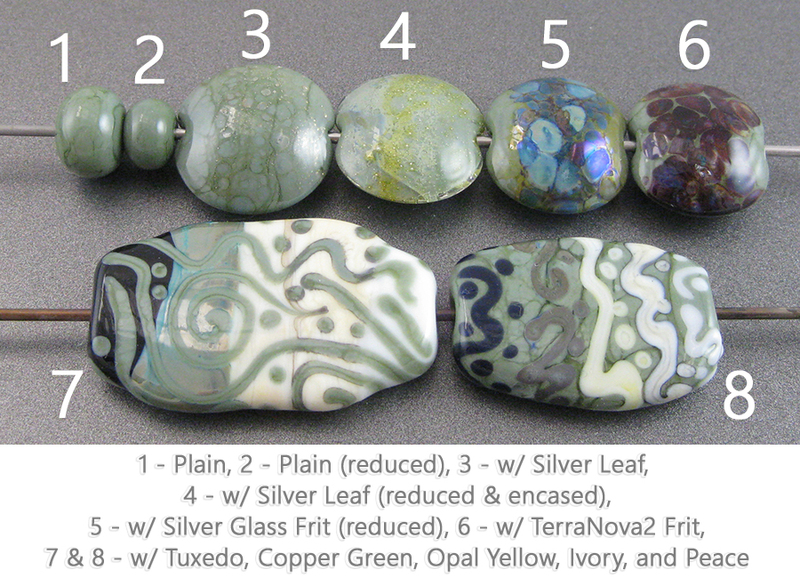 In the rightmost bead, you can see that my reduced and encased silver leaf developed a yellowish cast under the clear. You can also see some unfortunate cracks that seem like they are incompatibility. I encased here with Effetre 006 Clear. I sometimes have this problem with greens after I've added silver to them and encase, but then I'll try to encase another bead the same size and shape without the silver but with the same clear and get a better, crack-free result. I am not a chemist, but my working theory is that the silver changes the CoE or viscosity of either the colour or the clear (or both) in just the right amount to cause this problem. 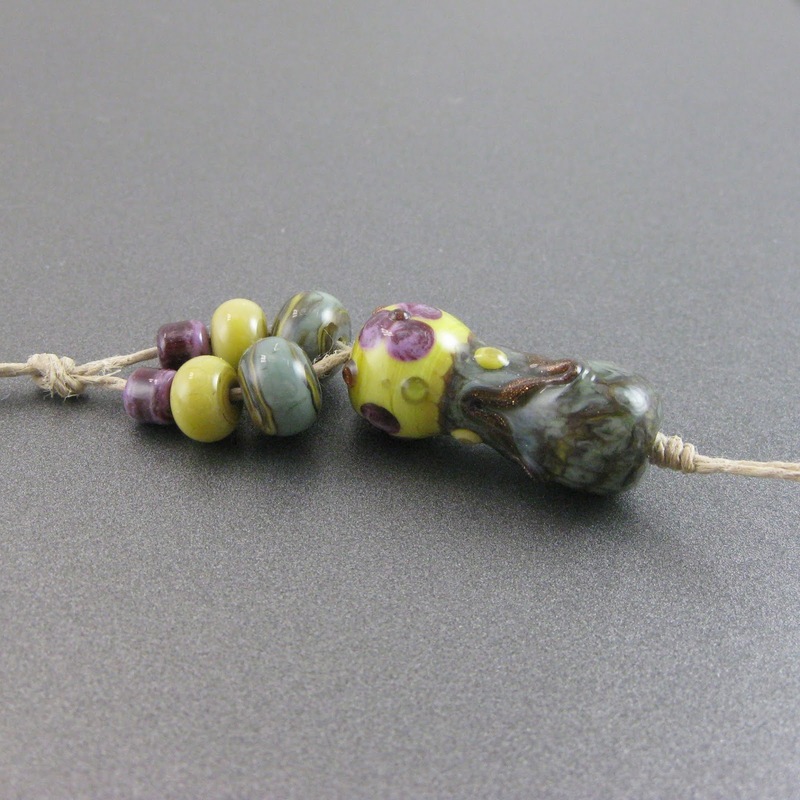 In the bead on the left, I got some pretty colours from my reduction frit, and there is interesting fuming on the base bead underneath it. My TerraNova2 frit got a nice starting strike, but no magic happened. Camouflage seems to separate on top of every other colour - it's not a very cohesive colour. It develops a gentle brown line reaction with Ivory, both when over or under it. In addition to the brownish outline, when Ivory is used on top of Camouflage, it separates quite dramatically. Using more reactive colours over Camouflage like Copper Green or Opal Yellow seemed to exacerbate its separation/crazing. 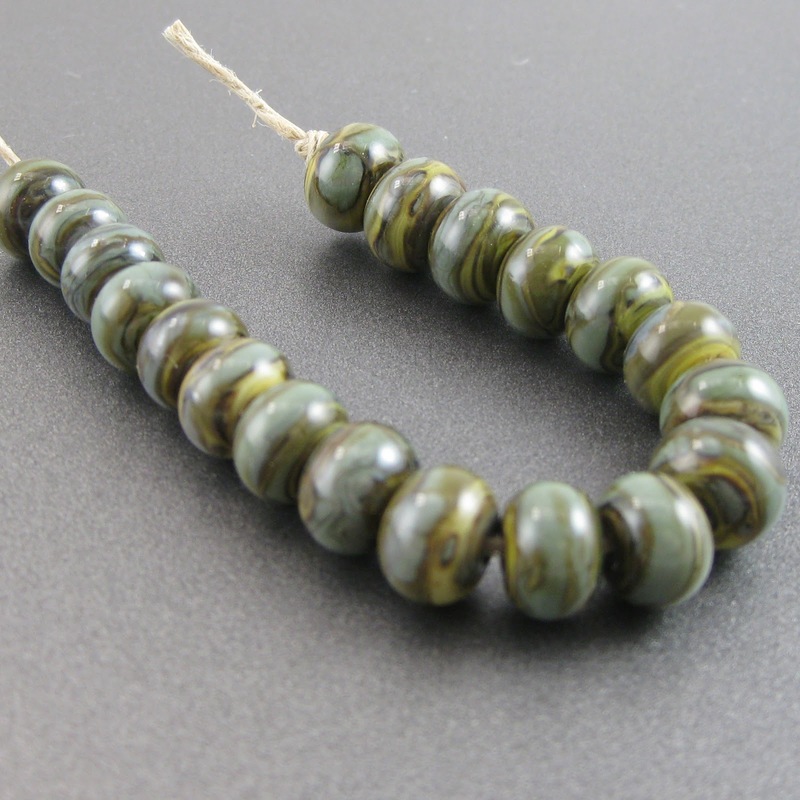 Here are some additional beads made with Camouflage.